Leading girls' prizewinners at Murrayshall. Left to right: Louise Duncan, Lorna McClymont, Molly Richmond, Jodie Taylor. Picture by courtesy of Nigel Pennie. 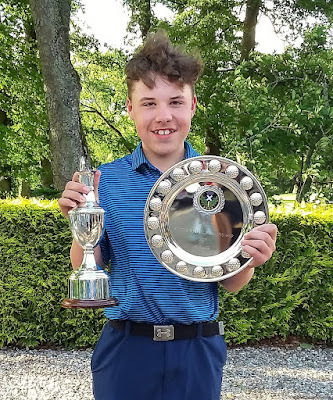 Aidan O'Hagan (Renfrewshire and Old Ranfurly Golf Club) and Louise Duncan (North Ayrshire and West Kilbride Golf Club) won the individual scratch titles at the Scottish schools golf championships at Murrayshall near Perth today (Monday). O'Hagan, who led for two rounds of the recent Stephen Gallacher Foundation boys' event, had scores of 70 and 72 for a total of 142 - four strokes ahead of the boys' section runner-ups Sebastian Sandin (Stirling and Dunblane New GC) and Lewis Irvine (Glasgow and Kirkhill GC) who both had rounds of 75 and 71 for 146. 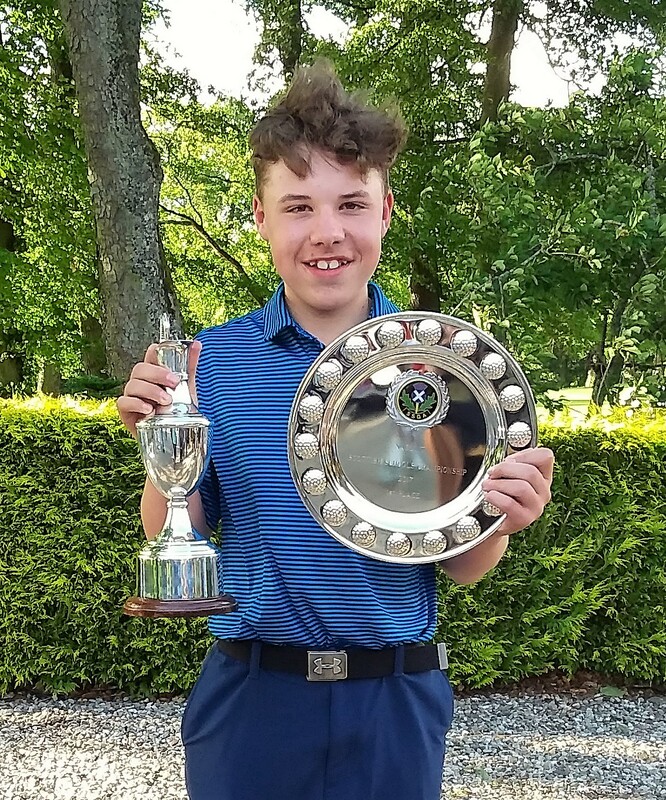 South Ayrshire (Cameron Johnstone and Ruben Lindsay) won the boys' team title with a total of 297, only one shot ahead of runners-up Fife (John Paterson and Ben Caton). West Kilbride Golf Club member Louise Duncan won the girls' title with steady stores of 73 and 72 for 145, which gave her a five-stroke margin over runner-up Lorna McClymont (West Dunbartonshire and Milngavie GC) (70-80) with Molly Richmond (South Lanarkshire and Strathaven GC) third on 154 (74-80). The girls' handicap section was won by Jodie Taylor (Dundee City) with a net total of 147 (70-77) off 10. 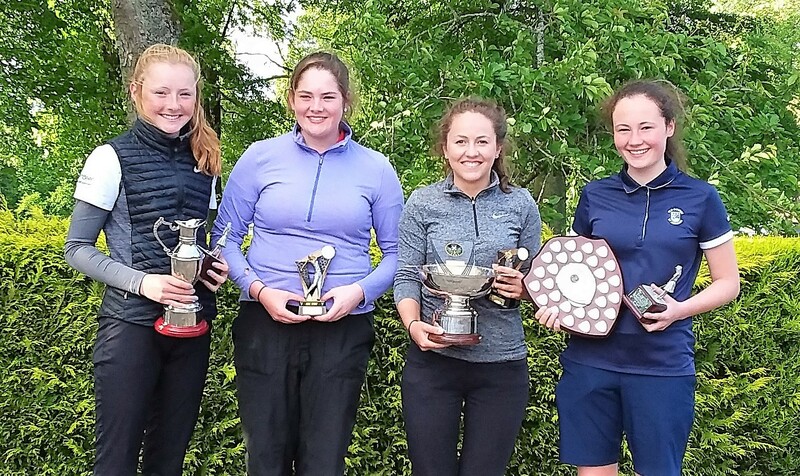 Megan Ashley (Perth and Kinross and Strathmore GC), playing off five, was second on 150 (73-77) and Zoe Morton (Forth Valley and Auchterarder GC), playing off six, finished third on 151 (75-76). The girls' team event was won by Lanarkshire with a total of 323. Their representatives were Molly Richmond and Eilidh Crawford. Dunbartonshire (Megan Docherty and Lorna McClymont) were second, only one shot behind on 324, with Perth and Kinross (Katy Alexander and Christine Wietrzyk) third on 325.